Priya Prakash Varrier says the controversy and FIRs are over the lyrics of the song Manikya Malaraya Poovi, which is a traditional Muslim song from the Malabar region of Kerala. 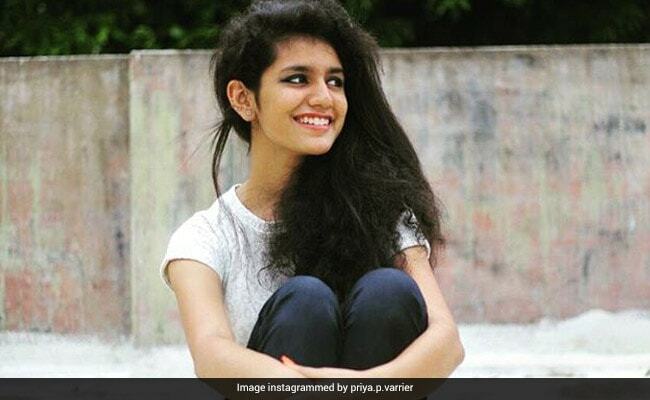 A group of young men in Hyderabad filed a case against the makers of Priya Prakash Varrier's film. New Delhi: The Supreme Court will hear tomorrow teen Malayalam actor Priya Prakash Varrier's petition against a First Information Report (FIR) filed against her and the director of her upcoming movie. The top court agreed to hear the matter after her lawyer sought an urgent hearing of the plea. Ms Varrier, 18, who became a social media sensation overnight earlier this month with her wink and smile from her film clip, approached the top court yesterday. In her petition, she said complaints against her were filed in Telangana and Maharashtra. She said the controversy and FIRs are over the lyrics of the song Manikya Malaraya Poovi, which is a traditional Muslim song or a Mappila song, from the Malabar region of north Kerala. "The song describes and praises the love between the Prophet Mohammed and his first wife Khadeeja and this has been misunderstood by the complainants," Ms Varrier said in her petition. The actor's lawyer Harris Beeran said the song has been there for the last four decades and there has been no complaint in Kerala but multiple complaints were filed - one in Andhra Pradesh and four complaints in Maharashtra. Clips from Manikya Malaraya Poovi featuring the undergraduate student winking and giving a flying kiss to her co-actor have viral and became fodder for countless memes online. A group of young men in Hyderabad filed the case against the filmmakers alleging that the lyrics of the popular song from the film Oru Adaar Love hurts religious sentiment of Muslims. A Hyderabad-based Islamic seminary issued a fatwa against the song, saying the government should have it removed as it hurts the religious sentiments of Muslims. An engineering student approached the police claiming that the song makes an "objectionable" reference to Prophet Muhammad's wife. A case was then registered last week for "deliberate and malicious acts intended to outrage religious feelings of any class by insulting its religion or religious beliefs". Another complaint was filed by a businessman, Zaheer Ali Khan, who demanded that either the song be removed from the film or the lyrics be changed. Oru Adaar Love, directed by Omar Lulu, is scheduled to release on March 3.